Companies in a wide range of industries are exploring blockchain technology’s potential impact in their space and deciding how they can benefit from this emerging technology. For example, Telecommunications and Media & Entertainment (TME) companies are investing in blockchain to improve their bottom lines. In this series of articles, we’ll examine the challenges facing TME companies and look at how blockchain can address those specific challenges. We’ll look at use cases relevant to the industry and suggest possible implementations. And we’ll discuss how blockchain can be integrated into the existing enterprise environment, including analytics, cognitive, and IoT systems. TME companies, like a lot of businesses, are looking for opportunities to generate more revenue and develop new services using blockchain. The good news is the opportunity to benefit are real. IBM has worked with many TME companies to help them address their challenges. The TME industry is going through an important transition phase characterized by disruptive trends. The telecommunication market in developed countries is saturated and growth is slowing down. New players have entered the market with disruptive offerings, competing directly with the incumbents. Telecom and media companies reacted with an increase in merger and acquisition activity, creating bigger conglomerates. Customers have felt the impact, as well. They have been empowered by new technologies and increased competition: They can easily move from one provider to another and opt for a new disruptive offering, moving away from the traditional phone or TV companies. On the other hand, incumbents need to invest in new technology (high-speed internet and 5G, for instance) to provide the expected level of service. Finally, a related trend in the advertising industry is the explosion of programmatic advertising, which will likely grow exponentially in the next five years. TME companies are facing two kinds of challenges. On one hand, revenue growth is slowing down because of market saturation and increased competition. Companies are trying to react through growth via acquisition, as previously mentioned, and through expansion to new businesses, such as cloud computing, Internet of Things, etc. On the other hand, costs need to be contained to maintain adequate levels of profitability. This means that TME companies need to streamline their operations and make them as efficient as possible, which includes ensuring a positive customer experience. Retaining a customer is far less expensive than winning a new one. Required investments in new technologies contribute to the surge of costs. To reduce their network expenses, companies are looking for smart ways, such as cloud computing and virtual network services. Applying blockchain technology to any business network or process provides three benefits: reduced costs, reduced risk, and increased trust. Streamlining internal processes – This includes using blockchain for internal efficiencies, as well as interactions with suppliers and other industry partners. TME companies can optimize their operations by using blockchain to track their network supply chain, to speed up payment and settlements process (for content, for roaming charges, etc. ), and to sell advertising. Providing services built on blockchain – Once trust across a business network is ensured, the sky is the limit. Blockchain is the enabler of new businesses such as ad-exchange marketplaces (providing complete transparency across the whole programmatic advertising supply chain), identity management services (providing users with a digital identity that can be used for online transactions), and, of course, mobile payments. These are the new business that will bring growth to the industry. Collaborating in business ecosystems – By serving each ecosystem participant as a peer and trusted partner, blockchain puts TME companies at the heart of different ecosystems, such as content distribution and digital advertising, allowing for new business models and value creation across companies and partners. In a business network, value is generated by the flow of products and services across the network in transactions and contracts. The business network operates by transferring assets between parties. Anything that is capable of being owned or controlled to produce value is an asset. There are two fundamental types of assets: tangible (such as content) and intangible (such as a service agreement). Key to managing the assets across the network is a ledger. A ledger is the system of record for a business. Businesses use multiple ledgers for the different business networks they participate in. Key to a ledger is a transaction (an asset transfer onto or off the ledger) and a contract (conditions for a transaction to occur). The novel blockchain architecture gives participants the ability to share a ledger that is updated every time a transaction occurs through peer-to-peer replication. Cryptography is used to ensure that network participants see only the parts of the ledger that are relevant to them, and that transactions are secure, authenticated, and verifiable. Blockchain also allows the contract for asset transfer to be embedded in the transaction database determining the conditions under which the transaction can occur. Network participants agree on how transactions are verified through consensus or similar mechanisms. Oversight, compliance, and audit can be part of the same network. The participants are the same as before; in this case, it is not a disintermediation play. Shared ledger – An append-only distributed system of record shared across the business network so that all participants have visibility on what is happening. Smart contract – Business terms embedded in the transaction database and executed with transactions so that the appropriate contracts are executed when a transaction occurs. Privacy – Ensure that transactions are secure, authenticated, and verifiable. Trust – Transactions are endorsed by relevant participants. Transparency – All participants in the network are aware of all transactions that impact them. Consensus – All participants agree that a transaction is valid. Immutability – No participant can tamper with a transaction once it’s agreed upon. If a transaction was in error, then a new transaction must be used to reverse the error, with both visible. Finality – There is one place to determine the ownership of an asset or completion of a transaction. This is the role of the shared ledger. IBM has developed a set of use cases to help our TME clients face their industry challenges. Telecom supply chain management – Telecoms have a complex supply chain that extends across multiple parties managing physical and virtual assets. The supply-chain efficiency can be greatly improved across suppliers and distributors by sharing data in a secure and transparent manner using blockchain. Linear advertising sales – Streamlining the ad sales process using blockchain among publishers, agencies, and advertisers in the TV ad space improves the transparency across the different parties and positively impacts the bottom line of media companies. Dispute resolution – Telecoms finance much of the equipment and services they provide, and blockchain can be used to improve the efficiency of commercial financing business by sharing data in a secure and transparent manner, which reduces disputes across the different parties. Roaming, fraud, and overage management – A common problem for telecoms is fulfilling roaming contracts, reports, and payment settlements among communications service providers (CSPs) and identifying potential fraud with subscriber authentication across roaming networks. Blockchain can be used to improve the visibility of key aspects, such as billing, fraud, overage, and identity as subscribers move across different networks. Music royalties collection – Tracking the copyright metadata to streamline the royalty collection process for the music industry directly impacts revenue for media companies. Applying blockchain enables the different parties to more accurately track royalty payments, automate costly reconciliation processes, increase digital rights agency contractual power, and facilitate engagement with digital music users. Identity management – A decentralized, trusted identity that scales can result in innovative customer engagement. Telecoms can provide this identity service as they have access to customer data that can be integrated using sources from industries with blockchain being the underlying engine with the trusted data. Mobile number portability – The end-to-end management of number portability requires multiple parties, including regulators, the donor CSP, the recipient CSP, and the subscriber. CSPs are able to reduce process times with access to accurate information, reduce costs by minimizing information handoffs, and reduce risk by streamlining error-prone steps. Mobile payment with eSIM activation – Providing services built on top of existing CSP offerings has great value. For example, an intelligent vending machine with mobile payment and eSIM activation for tracking devices using IoT are added services that a CSP can build on top of blockchain while collaborating with key partners. Transparent ad supply chain – The current ad supply chain is complex due to lack of auditability, lack of evidence, and a fragmented system of records. Advertising agencies, advertisers, and publishers can streamline and optimize the digital advertising supply chain using blockchain. In this brief overview of blockchain technology, we’ve shown how this digital ledger technology is relevant to challenges faced by the TME industry. The use cases we’ve summarized illustrate exactly where and how blockchain is beneficial. But we’re just getting started. Our next article in this series will dive deeper into these use cases by providing a high-level architecture, implementation overview, and sample code snippets. Though our focus is on the TME industry, the underlying technology and approach to developing blockchain solutions are applicable to many industries. 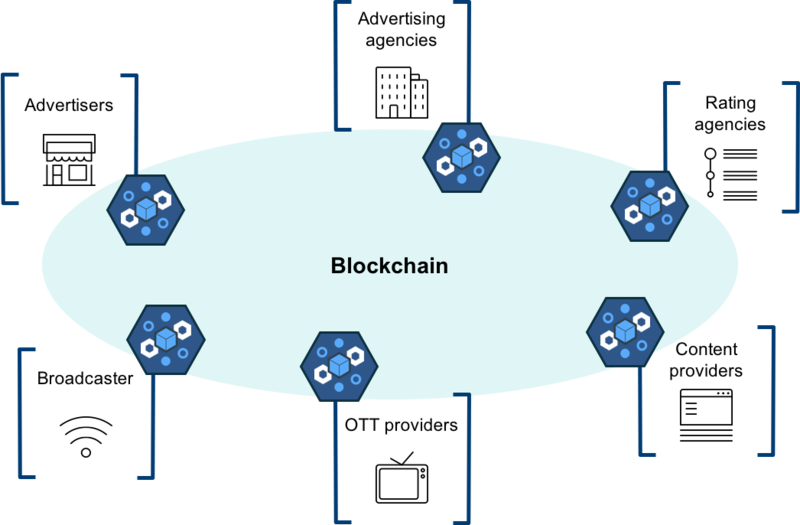 Rewire your industry with IBM Blockchain Find more industry solutions that use blockchain. Reimagine telecommunications with Blockchain See what blockchain can do for communications service providers.